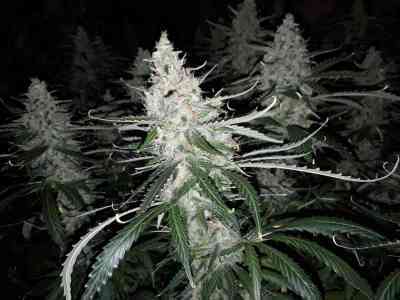 Remo Chemo is certainly one of Dinafem´s most special strains. To begin with, she comes from our first collaboration with the legendary Canadian cannabis grower Remo, also known as Urban Remo. Besides, her extremely high THC levels not only make her a must for cannabis gourmets with a liking for mind-blowing genetics but they also confer a myriad of therapeutic properties on her. Urban Remo is undoubtedly one of the most loved celebrities in the cannabis field. The YouTube channel of this Canadian grower has lots of subscribers and his strain reviews have become indispensable for any marijuana user. At Dinafem, we had long been itching to work with him. That’s why we didn’t hesitate when the opportunity came up. This world-renowned cannabis activist has always been surprised by the lack of cannabis genetics when traveling to Europe. That’s why we have joined forces with Remo and have found a solution to this issue by creating a Canadian feminised strain that bears his name. The result has been Remo Chemo: a super potent strain, with incredibly high THC levels, deriving from the UBC Chemo; a strain that, according to legend, was developed by some researchers from the University of British Columbia with the objective of alleviating the side effects of chemotherapy in cancer patients. UBC Chemo, whose THC content is around 24 %, is never missing in the garden Remo’s got in Maple Ridge. In his case, she helps him relieve the back pain he is in as a consequence of a road accident. It is precisely this chronic pain what makes Remo always opt for high-THC strains that help him deal with it. And, among the ones he generally consumes, UBS Chemo is particularly effective. Remo Chemo derives from the cross of a UBC Chemo and a regular Bubba Kush male. Dinafem Seeds has started out with the cutting obtained from such cross and, after seeing the amazing results of the test, we backcrossed her to ensure the genetics was not diluted but remained pure and intact, with her typically Indica appearance, characterised by a mid-sized structure with broad leaves. Remo Chemo is a dense and sturdy plant that must be evenly pruned, low branches included. At the end of the flowering, her dark-green leaves tend to acquire purplish hues which are sometimes so dark as to seem almost black. A real sight to behold. This plant’s yielding properties are more or less what we’d expect from a Kush-derived strain and, without her being particularly heavy-yielding, her crops are really potent, which balances the final outcome. The Kush-style buds she produces have the size of a golf ball: round, uniform and compact. In fact, they stand out for their remarkable density and resin count as well as for their high THC levels, exceeding the 20 %. This Indica-dominant strain thrives when grown in dry environments and provided with intense light. As for the right amount of nutrients, we must ensure our plants are not overfed since this could be detrimental to the flavour’s intensity. Thanks to the legacy of Bubba Kush, the lack of water is not a problem for her. However, if we want to boost her yielding properties, she’d better be well hydrated. Remo Chemo delivers a potent effect that, thanks to her high THC levels, helps alleviate the side effects of cancer treatment (vomiting and nausea), boosts the appetite and reduces pain. But Remo Chemo can be used for recreational purposes as well. Her THC content being so high, and the CBD so low, her effect is physically and psychoactively intense. Remo Chemo’s potency and exotic origins make her one of our most special genetics: she’ll delight THC-lovers seeking a highly psychoactive strain.